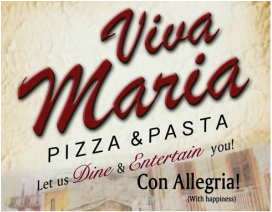 Viva Maria is a family-owned, local restaurant. Dominic came to the United States from Italy when he was 15 and has been tossing pizzas ever since. He met his wife, Susan, in 1989 and they quickly became a team, working side by side in their adventures from that moment on. They are joined in the business by their daughter, Maria, and their son, Giuseppe (Joe). They recently were able to come home to Ada, Ohio, which they feel is the perfect location for what they do and who they are. The Armory offers a lot of space with which to best serve their customers, but Ada is small enough for the owners to get to know all of their customers and expand their family, which Susan and Dominic really enjoy. The family prides themselves on making each and every dish fresh for each and every customer. Their goal of quality, quantity, and freshness may sound like a cliché, but it is completely true and has served them (and their customers!) well since they opened their very first restaurant. View our menu! We offer a wide range of delicious dishes, from authentic Italian to cheese steaks straight out of Philly to other American favorites. We have two party rooms in the restaurant and will cater events. 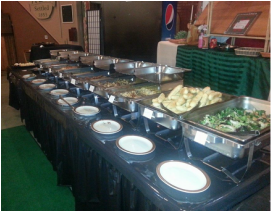 Click through to view catering menu options as well as pictures and descriptions of our party rooms. 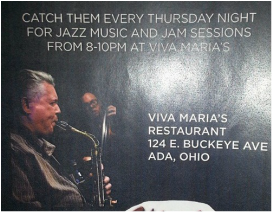 We host live entertainment every Friday and Saturday evening as well as on special occasions.